Bubby is so proud to be riding his new (to him) two (plus training wheels) wheel bike! Logo, trying to stop before he hits the photographer. Today my plan was to head to story time, followed by a picnic lunch at a nearby park, and maybe a walk down by the river. Sounds like fun, doesn't it? Unfortunately, Bubby's plans were different: to go fishing. We compromised by hiking to a waterfall followed by running a few errands. As we were walking back up that steep, steep hill (I'm always surprised by just how steep it is--selective amnesia, I guess), I started thinking about plans. Have you ever heard that saying, "we plan, God laughs"? We know that God has great plans for us, but how often do we say to God, no, I don't really want to do your plan today--I had something else in mind? Now really, I can't say that my plan was any better than Bubby's plan for today, and our compromise ended up being (probably) better than either of our separate plans, but how in the world could our puny little human plans ever possibly be better than God's good plans for us? How many times do we stamp our feet metaphorically, stubbornly insisting on our own way, and force a compromise, that may be good, but is merely a shadow of God's intention for us? I remember one year on my birthday, I must have been turning 4 or 5, something like that, and our family's plan was to go to McDonald's to celebrate. It sounds funny now, I'm sure, but I had probably only been to any restaurant less than 10 times in my entire life, so McDonald's was a big treat, and I was really looking forward to it. We all piled into the car and drove off. When we stopped, we were not at McDonald's, and I threw a major fit. I don't know if my parents even managed to talk me into getting out of the car. My Dad had driven to a mini-golf course, to surprise me--it was free for birthday girls, and they were planning on going to McDonald's afterwards. My parents had good plans for me--they thought I would enjoy playing mini-golf, and they were probably right, but in my frustration at the change in plans, I refused to let the good plan happen to me (sounds like something Logo would do!). One of the things that being a mother has taught me is that sometimes, I just have to let go of my plans. Things happen. Today I figured if I dragged Bubby along and he didn't want to be there, neither of us would be happy. I don't like letting go of my plans, and it's rarely easy, but, as I experienced today, sometimes letting go of my intentions turns out better than I could have anticipated. How much better is God's plan for us?! Friends, I urge you to let go of your plans and to let God's good plan happen to you--you may not like it, it might not be easy, but it will be so much better than anything you could have dreamed. Here's Code-man with his alter ego, made for a year end Cub Scout puppet show. Logo. That says it all. Our 2 year old nephew, Ua, broke his leg Sunday night, jumping off his bed. He got his cool blue cast put on this morning, and I guess he's been calling it his drum (the kid loves percussion instruments). His mama, Chip, says he's doing OK. He'll be able to walk on the cast, if he wants to, and he only has to wear it for 4 weeks. 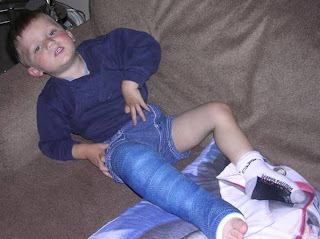 I just keep coming back to this: he broke his leg jumping off his bed. No, Ua does not have an unusually high bed--it's not a bunk bed or anything, just a regular ol' bed. All three of my children regularly jump out of things higher than Ua's bed. Just this morning, Bubby spent half an hour jumping from the arm of our couch to the floor, over and over and over again. This was after he had already spent a good 20 minutes doing flips with the assistance of my legs and/or arms. And before that he spent about 10 minutes jumping from the top of the toy box (the bigger one--almost taller than him) to the floor (he's the jumpiest of the kids, I've gotta say). How have we managed to escape with only a cracked thumb (and that wasn't a result of jumping, really) through 8 or more years of increasing numbers of children jumping from increasing heights? Come to think of it, my brother and I used to jump out of all kinds of high places, too, and between the two of us, the only broken bones occurred when Sheppy fell on his own thumb while playing soccer. I suppose there's something to be said for all that landing practice! Mom, Dad, you did know we used to jump out of our windows in Bremerton, right? We were practicing fire drills. And conducting scientific experiments. I took the boys fishing Friday night, and Scott took us all on Saturday. We didn't catch anything, but it was nice sitting by the lake, watching the loons (the waterfowl, not the children. Well, it was nice watching the loony children, too), seeing the fish jump, and looking at the clouds.